METAL PULP AND PAPER: Hello Ira, glad to be catching up with you. Thank you for taking the time off to speak with us at Metal Pulp And Paper. We really appreciate it. How are you? How are things going for you and your band Dehydrated so far, this year? IRA SIDENKO: Hello! I'm good, thanks! I can`t say that this year for Dehydrated was one of the best, but now Dehydrated is okay. We are preparing for new concerts, and also, we are planning to shoot a new video. 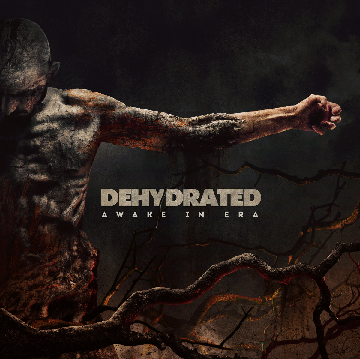 MPAP: For everyone who might not have heard of your band Dehydrated just yet, can you give a brief introduction to what you’re all about and what they can expect to hear? IRA: I don't how to say it in English, he-he but I`ll try! Our music is crazy and it can break your brain. It is the dangerous mix of brutality and fury of Death Metal mixed with melody and complexity of progressive music! Listen and head bang. MPAP: Dehydrated hail from Tomsk/Siberia Russia? What is the music scene like there? IRA: We are from Siberia! Of course, it's part of the Russia too, but our country is huge. Siberia is far from the center. The way of the life is different here, we have other climate, other level of life and other possibilities. Previously, Siberia had a very strong metal scene, and I used to talk about it to everyone. We had many great bands, but now, unfortunately, everything has changed, the scene has become weak, and attendance at the concerts, too. Of course, Russia has great bands, and I think you know them, it's Katalepsy, Arkona and the others. There are some people who are striving for something, but in general, I see a big decline. 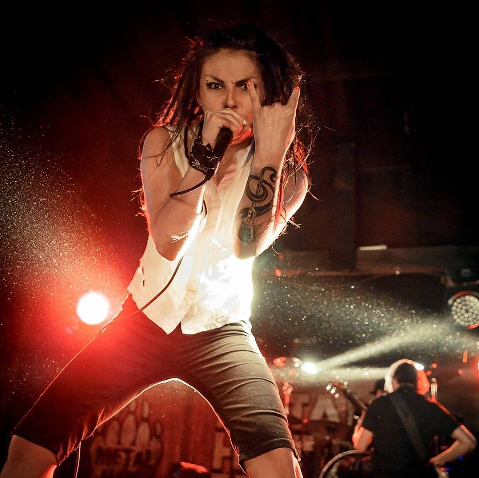 MPAP: Is it hard for a female-fronted death metal band to breakthrough? IRA: Yes. I think that break through is hard in any way, and it doesn`t matter if it is death metal or post-rock, female-fronted band or male. Now we have a lot of bands, and various kind of music. But we have great possibilities, and one of those, surely, is the internet, and any man alive can found music for himself. MPAP: Do bands that start out there get any radio or television airplay at all? Is it hard to be heard there? IRA: If we talk about metal, it's all about the internet. Internet radio, internet-television. Although it still happens somewhere and on the radio, you may hear a metal song. Our band took part in such a broadcast; it was very strange for our country. Our crazy music is on the radio. MPAP: When Dehydrated was forming, how was it decided that you would sing in English? Why not in your native language? IRA: We sing not only in English. We have a couple of songs in German. I don't know, English is the international language, we play European metal. It was somehow logical to sing in English. Surely enough I would like to perform songs in Russian too, so, in the nearest future, we`ll do it. MPAP: Speaking of your vocals, let’s back up just a bit for a moment. You obviously didn’t just wake up one day and boom you were a singer? What leads up to this? What led up to you wanting to become a death metal vocalist? Did you have an older brother that might have turned you on to that genre of music? Or were you just around friends that listened to it all the time? IRA: Unfortunately, I hadn`t an older brother or such kind of friends who could show me that the metal music exists. But I had one friend, a girl with whom we used to listen Rammstein! And in one moment I woke up and understood that I want to create my own band. I wasn`t able to sing, or play instruments, I just wrote poetry. But my dream about creating the band was powerful! I want to thank my friends for their help and belief. The music which I listened, became heavier, so I quickly came to the extreme vocals and began to learn it myself, torturing my bundles. MPAP: Do you remember the first time you heard a death metal band? Which band was it? IRA: Yes, of course, it was Aborted. The first time when I got wise with metal music was while listening to music on the road to study. Damn, it was amazing, tons of aggressiveness and brutality, I was absolutely impressed. MPAP: Did you start out listening to death metal, or did your musical tastes progress into death metal later in life? Like, say did you first start out listening to bands like Led Zeppelin or the Scorpions? Then, as the years went by, you got into death metal bands like Death, Carcass, Deicide, and Morbid Angel? IRA: As I told earlier it was band of Rammstein, it was the first metal band with which I fell in love, then in my life appeared Slipknot, then the other metal and alternative bands. And after this, I found black metal and death metal. MPAP: In Tomsk, how do you hear about new bands? Are there music stores around that you can go to and look around to see what new music is out there? Or is everything only just heard from the internet? IRA: Yes, we have music stores, but we find out about new bands only with the help of the internet or from some friends. We don't have big festivals where we can find out new names, so only internet. MPAP: Do you ever get bad vibes or hear hurtful comments from someone saying death metal is for men only, it’s not for a woman to be involved with? IRA: Yes of course, not so often, but sometimes it happens. Although I think that it's the last century. Now women do everything that they want. Women can be a president or can lay the rails and also, she can play in a death metal band. I think it is normal if she really likes what she is doing! But the main thing is to remain a real woman. Maybe men feel the spirit of competition and that`s why they spread bad vibes, but they have nothing to worry about. They do it a little bit better, still he-he. MPAP: What do you say to them? I’m sure the words are harsh or do you just turn and walk away, not worth your time to speak to them? IRA: I hadn`t much experience of getting bad vibes right in the face. People who surround me, most of the time support me and they are proud of what I`m doing. Such vibrations exist in the social media. I don't answer them. MPAP: The song "Sickness" is very dark in the lyrical content? What is it about, and where did the inspiration come from? IRA: "Sickness" is a very special song for me, and yes, it is very dark. This song is about my father… About the painful relationship of my parents... Lyric "Sickness" waited for the suitable music for a long time. I wrote this text when I was 19 or 20 years old, it was before Dehydrated! And when I created the main melody for this song, I knew that will be "Sickness" and after this, my boys created amazing music! MPAP: Why did you release the song "Sickness" as a single in 2016, when it was previously already on Awake In Era (2015)? IRA: We presented Awake In Era in the end 2015, so the video could be released only in 2016. MPAP: How do you feel you have grown as a singer from your demo Suffering From Mummification (2010) to your latest full-length release Awake In Era? IRA: When I listen to our first EP my ears are bleeding. I`m not as strong as rock listening it for too long. I sang terribly. In the album Awake In Era, I felt more confident, I want to believe that my vocals became better. And what had happened to my voice after the recording of album, I hope you will hear soon. I continue to learn something new. MPAP: If the opportunity presented itself, who would you want to collaborate with from a band in the United States? IRA: Gosh, doubtless with the Whitechapel, it's my love, but nevertheless, my main fondness is Slipknot. MPAP: What’s next for Dehydrated? What can your fans expect? IRA: I don’t like to talk about our plans until they are implemented. In addition to upcoming concerts and a new video, I hope that we can do something completely new. We will work on this, and you`ll stay with us! MPAP: And last, are they any bands out there from your hometown that you’d like to give a special shout out to so everyone can also check them out? IRA: As I said before, we have a lot of great bands, but unfortunately, many of them ceased to exist. But you can check Apokefale, Dark Revenge! It’s worthy music. MPAP: On behalf of myself and Metal Pulp And Paper, I’d like to thank you, Ira, for spending some time with us getting to know you and your band. Look forward to what Dehydrated does to finish out the year 2017 and beyond. IRA: Thanks to you too, for your questions and support! It was great! MPAP: Any last words you’d like to say to all the readers and your fans worldwide out there? IRA: Thank for everyone who listens to us and support us, it's very important for our band! I hope that we will meet at the concerts! Stay true and keep supporting metal.